While I'm focusing on the 70's and 80's, which I consider the "Helvetica and Abstract-A" glory days of American Motors, I can't resist this! 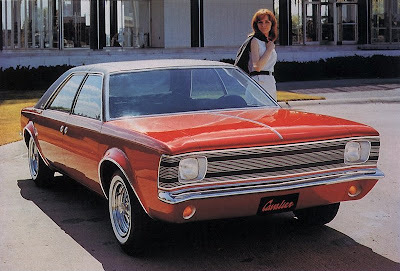 Before the name Cavalier became a disappointing replacement for GM's Monza, it was applied to a styling exercise on symmetry at AMC. All about it's interchangeable parts, the Cavalier's front right fender could be exchanged for it's rear left , and front left for rear right. The hood and deck - interchangable, while the suicide hinged doors and door glass were symmetrical too. A flying buttress C pillar gave the Cavalier a more conventional long hood / short deck profile, despite the strict symmetry. I love the door handles in the side view - and cant help but wonder what modernist building this was photographed at - maybe something at an AMC facility. The styling of this car totaly works when contrasted with the other similarly sized offerings out there at the time - Corvair and Falcon. There's something so absolutely familiar and 'Corvair' about the proportions. Richard Teague would go on to style the similar production Hornet, as well as Pacer and Gremlin. AMC Cavalier follows earlier AMC symmetrical design exercises such as NKI AMC Metropolitan prototype. The early Nash Ramblers and Ambassador/Statesmans employed similar front and rear symmetry if only in idea, not fully executed into actual production, like the AMC Hornet. The production Hornet's symmetrical dash models the Cavalier profile and is the only dash in automotive history where the dash is a schematic diagram of the car itself.